When I first arrived in Beijing to study Chinese many years ago (we won’t mention how many), I was intimidated by the notion of having to find my way around a city where, because of my lack of Chinese, I had become virtually illiterate overnight. Back then, barely any signs were in Pinyin, let alone English. And when, after my two hour commute on public transportation and bicycles, I finally arrived at the Beijing Language and Cultural Institute early in the morning on day one of my language lessons, I made a quick note to self that I would always be able to recognize the entrance to my university (a Communist cookie-cutter monstrosity) by the gargantuan concrete Chairman Mao towering over the entrance. I disembarked from bus 375 on day two to the horrific realization that Chairman Mao, in an omnipresent autocratic fashion only a person of his stature could muster, not only towered over one entrance but all the entrances of every single building along the avenue. Surely not the most aesthetic structures but definitely making a point. Deceased politicians armed with faces that could launch daggers, Kalashnikov-wielding soldiers standing like launch-ready missiles on 20 ft tall pedestals and babushka-donning grandmothers who look so large and sturdy that not even the fiercest bull would take them on. Nothing says welcome to our fatherland like the monstrous stern-faced monuments staring down all who dare to venture along the broad bare avenues of the communist capitals. And after a while (and maybe a vodka or Sorghum wine or two) you start to see the charm of them a bit. Like Mao for instance. There he is. And there he is again. And again! (I know you). All the way up the road, Mao1, Mao2, Mao3, (you get the picture) lining up parade style, patiently waiting to usher little insignificant you into the big bad institutes of higher powers. But those kind of constructions are for those places. Not for Vienna. If you visited, and it was a gorgeous day (not like the past four we’ve recently had), and the fountains were active, you might have just missed it. Funny, isn’t it? Austrians who usually pay such close attention to detail manage to erect something that can’t always be seen. Now why would they want to do that? Coincidence? The Stalinesque monument consists of a 12 meter tall Red Army soldier on Schwarzenberg Platz who stands atop a 20 meter tall stone pedestal, weapon slung over his shoulder as he guards over the square between Belvedere Castle and the Ring. At the end of World War II, just like in Berlin, Vienna was divided into four zones occupied by soldiers of the American, British, French and Russian armies. 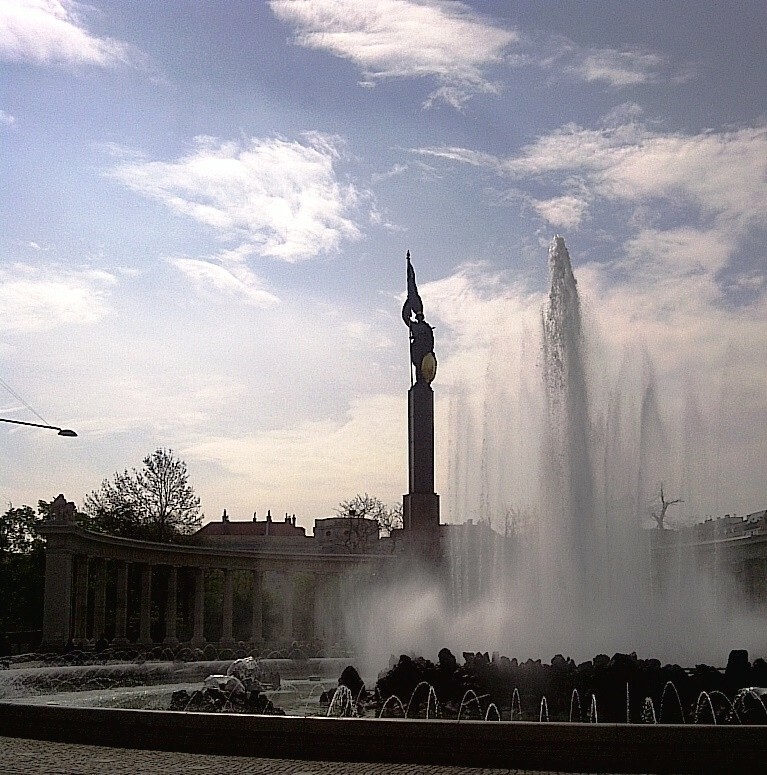 Stalin ordered the construction of the “Heroes’ Monument of the Red Army” (das Heldendenkmal der Roten Armee) immediately after the Russians took over the city on April 14, 1945. 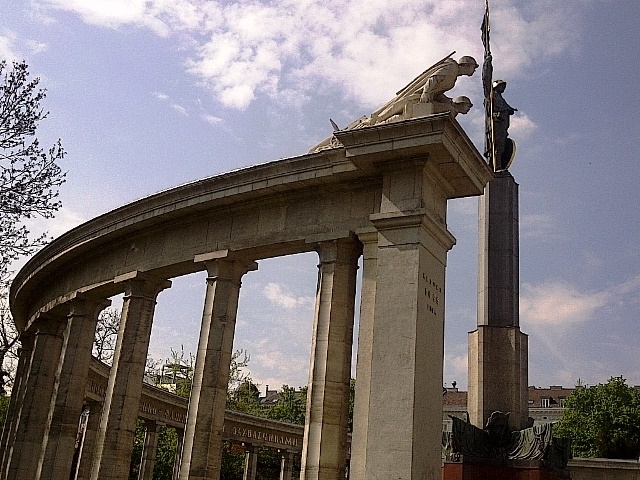 On August 19, 1945 the memorial was unveiled to commemorate the approximately 17,000 soldiers of the Russian Red Army who fell during the battle for Vienna in World War II. The monument has many names which reflect the degree of public acceptance of the memorial – everything from outrage (sometimes ending in vandalism) to tacit acceptance. The names include: Soviet War Memorial, Heroes’ Monument of the Red Army, the Liberation Memorial, the Victory Memorial and Pea Memorial (referring to the 1000 tons of peas Stalin had ordered be sent to the city on May 1, 1945 to be distributed to Vienna’s starving inhabitants). Eternal glory to the heroes of the Red Army who fell in battle against the German fascist invaders for the freedom and Independence of the peoples of Europe. Ewiger Ruhm den Helden der Roten Armee, die gefallen sind im Kampf gegen die deutsch-faschistischen Landräuber – für die Freiheit und Unabhängigkeit der Völker Europas. 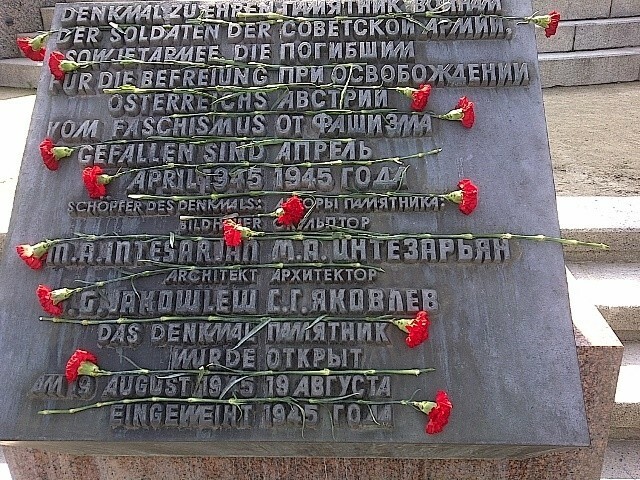 Monument to honor the soldiers of the Soviet army, who died for the liberation of Austria from fascism. Denkmal zu Ehren der Soldaten der Sowjetarmee, die für die Befreiung Österreichs vom Faschismus gefallen sind. Though more places were considered for the site of the memorial, Prater, for example, it isn’t hard to imagine why the Viennese would have suggested this spot as the perfect place for such a construction. I wasn’t along for the location tour in 1945 but I can imagine, in a supreme Austrian move of diplomacy, that the good gentlemen of the committee arranged for the large fountain also on the square to be turned off during the site tour. 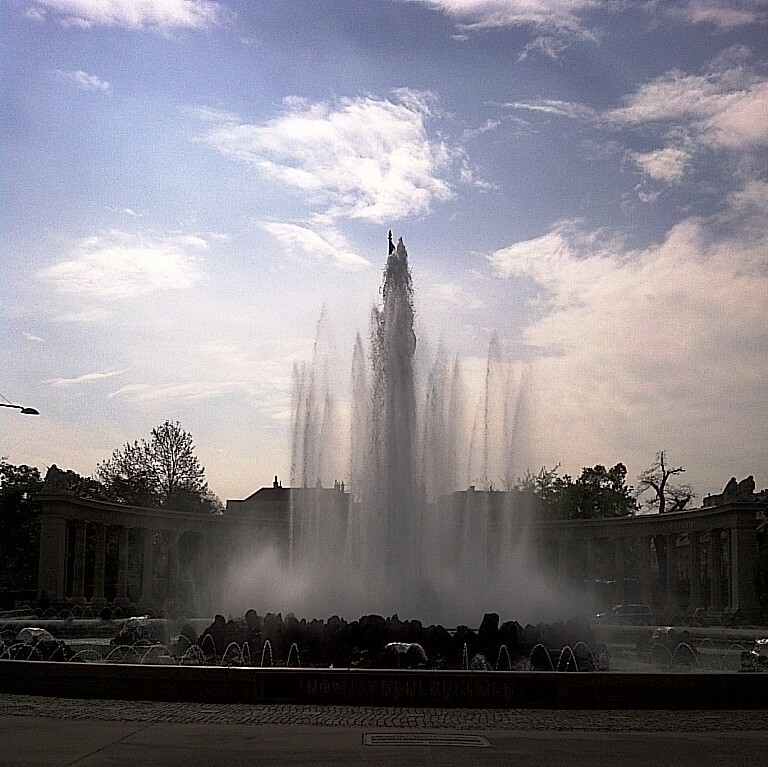 And they kept the high pressure stream fountain (Hochstrahlbrunnen) off throughout the construction period. Those darn fountains – always out of order. And since we’re doing a bit of construction work at this site anyway, why don’t we too use some prisoners of war to do some repair work on our old fountain. And lo and behold, shortly after the unveiling of the monument and not too long after all the hoopla died down, that fountain magically started working again. And man did it work. Larger and taller than ever! And when turned on full blast –oops! – it might just cover up the soldier behind it a wee little bit so that you can’t really see him from the Ringstrasse at all. Now that’s diplomacy. on August 18, 1962, a bag with bomb material was found and defused. The bomb could be traced to Italy. On the edge of the pool are 365 small water spout fountains symbolizing the days of the year. The six fountains between the edge of the pool and the inner island along with the island itself represent the seven days of the week. The 12 high water jets represent the months, the 24 low ones, the hours of the day and the 30 in the middle of the island, the days of the month. The original water jets from 1873 had only a tall jet stream for the year, and four jet streams on the island for the seasons as well as the 365 border water spouts for the days of the year. At night the fountain lights up red, pink, yellow, violet, blue and green.